In 8-quart Dutch oven, cook ground beef and onions over medium-high heat until beef is thoroughly cooked, stirring frequently. Drain. Stir in all remaining ingredients. Bring to a boil. Reduce heat to medium-low; cook 20 to 30 minutes or until vegetables and barley are tender, stirring occasionally. Spoon 5 1/3 cups of the soup into each of four 6-cup freezer/microwave containers. Cool 30 to 45 minutes. Cover; refrigerate up to 3 days or freeze up to 2 months. 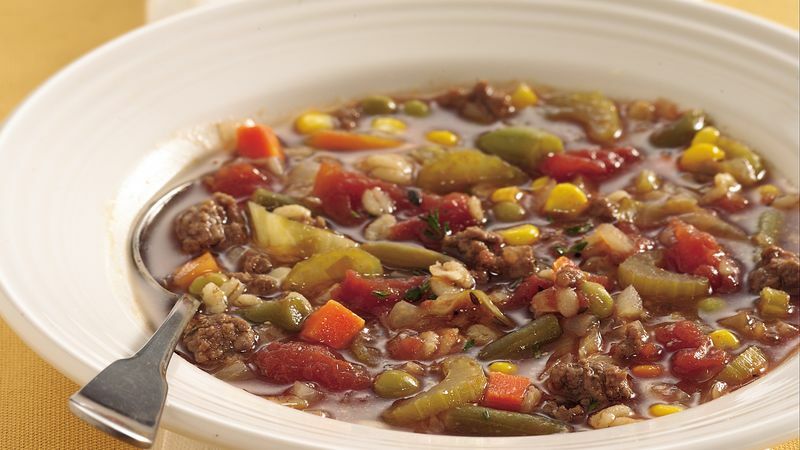 Thaw 1 container of soup in refrigerator for 24 hours, or uncover and thaw in microwave on Defrost for 30 to 40 minutes. To heat refrigerated or thawed soup, cover loosely and microwave on High for 6 to 8 minutes or until thoroughly heated, stirring once or twice. Spoon into 4 individual soup bowls. Vary the seasoning in this soup to suit your taste. Dried basil or marjoram can be substituted for the thyme, and regular salt could be used instead of the seasoned salt. If you don’t have the garlic-pepper blend, use 1/2 teaspoon each of pepper and garlic powder. If you place the soup in plastic freezer bags, freeze the bags on a cookie sheet first, otherwise the bags can get stuck in the wire freezer rack.